After being an open question for sixty years the Tarski conjecture was answered in the affirmative by Olga Kharlampovich and Alexei Myasnikov and independently by Zlil Sela. 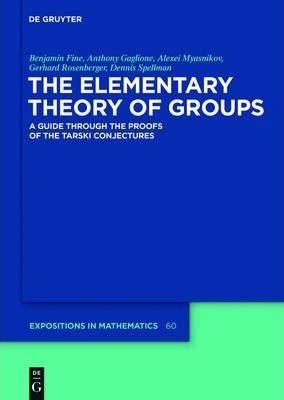 Both proofs involve long and complicated applications of algebraic geometry over free groups as well as an extension of methods to solve equations in free groups originally developed by Razborov. This book is an examination of the material on the general elementary theory of groups that is necessary to begin to understand the proofs. This material includes a complete exposition of the theory of fully residually free groups or limit groups as well a complete description of the algebraic geometry of free groups. Also included are introductory material on combinatorial and geometric group theory and first-order logic. There is then a short outline of the proof of the Tarski conjectures in the manner of Kharlampovich and Myasnikov. B. Fine, Fairfield U.; A. Gaglione, US Naval Academy; A. Myasnikov, McGill U.; G. Rosenberger, U. of Hamburg; D. Spellman, Temple U.